Mrs. Lou’s Pre K class at Woodbury Grammar School had a very busy year. 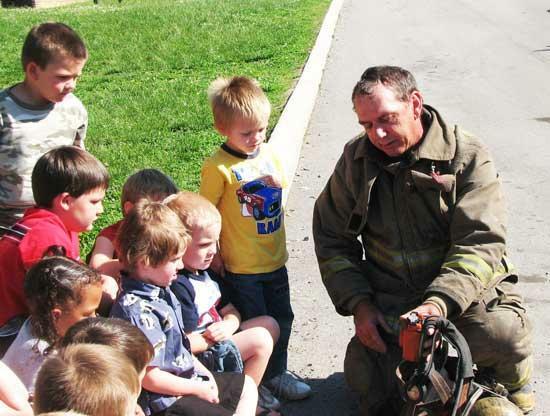 During the course of the year the four- and five-year olds learned about grocery stores, restaurants, medical clinics, farming and community helpers. The class was fortunate to have some community leaders volunteer to spend time in their class to explain their career to the class. Mr. Richie Hunter talked to the class about the role of a pharmacist. He explained how important it is to take only your medicine and to follow the directions carefully. He explained how the pharmacist works with the doctor to be sure patients get and take the proper medications. Mrs. Heather McCormick, RN, visited the class and shared information about what nurses do in hospitals and medical clinics. She discussed when and how to call 911 for emergency help. She provided the class with growth charts, coloring books and 911 certificates. Dr. Mark Roberts, DVM, shared information about his career as a veterinarian. Dr. Mark performed an examination on Mrs. Lou’s dog Bootsie and told the class how important it is to keep our pets healthy. He allowed all the students to listen to Bootsie’s heart with his stethoscope. John Passenger, Bill Johnson and other members of the Woodbury Volunteer Fire Department brought a fleet of fire trucks to the Woodbury Grammar School to explain to the students the role of firemen. They donned full fire gear to allow students to see how a fireman would look when entering a fire. This demonstration was most helpful in preparing students for what they could see in a fire. The students loved climbing into the fire trucks. Officer Lowell Womack shared with the students the responsibilities of being a policeman. This proved to be an exciting and productive year at Woodbury Grammar School Pre K.